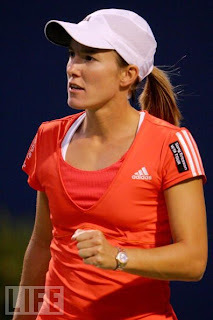 Former world number 1, Justine Henin, is set to face world number 20, Nadia Petrova, in an exhibition match in the Egyptian capital, Cairo, on December 12th. The Belgian star was set to play an exo in Dubai, but it was canceled and will now face Petrova at the Gezira Sporting Club in Cairo. Petrova, who reached a career high of number 3 back in 2006, started her tennis career in Cairo, where she spent most of her youth training, since her parents were athletics coaches there. Petrova and Henin have met on 13 previous occasions, where the Russian only managed to win twice. Henin just won an exhibition match against her compatriot Kirsten Flipkens in Charleroi in straight sets, and will make her official return to the tour - after her 18-month retirement- in Brisbane next January. Hi! Very good news! I hope it will be a good match before the Austalian Tour! Could you tell us (belgian fans) which TV channel is sending the match (if the match is on tv...). Do you have some information about livescores? We would like to follow the match in Belgium! Thanks a lot!!! Was not up to par honestly. It had some occasional moments but I think the excessive winds and the poor court didn't help.